Kazimir Malevich was the father of Suprematism, one of the most radical and influential of the schools of abstraction that were pioneered in the early decades of the 20th century. Malevich’s Black Square, painted in 1915 and now in the State Tretyakov Gallery, Moscow, is one of the great touchstones of modern art. Even before Suprematism, Malevich had had an influential and varied career. He had been born into a family that was originally from Poland, lending him a sense of outsider status that he would later explore by sometimes signing his works using the Latin alphabet, rather than the Cyrillic. From an early age, Malevich had been interested in art and eventually managed to attend art school in Moscow. Initially working in an Impressionist manner, he soon moved towards Divisionism, later developing a more distinctive style of painting that celebrated Russian tradition, often showing images of the peasants in their fields. Malevich was also influenced by Symbolism, and brought a spiritual quality to bear in many of his works. Malevich became involved with a number of the avant garde movements working in Russia during the early part of the 20th century, exhibiting alongside groups such as the Jack of Diamonds and the Donkey’s Tale. He was increasingly in contact with contemporaries such as David Burliuk, Mikhail Larionov and Vladimir Tatlin. His works reflected this, and also the increasing influence of works from the Parisian trailblazers such as Pablo Picasso and Henri Matisse, as he moved towards his own Cubo-Futurist style, a logical progression from the simplification of forms that had marked his earlier pictures. This would result in works such as Morning in the Village after Snowstorm, Solomon R. Guggenheim Museum, New York and The Knife Grinder, Yale University Art Gallery, New Haven. Malevich’s Cubo-Futurist style marked an increasing pictorial distance from the object depicted. Increasingly, he and some of his contemporaries began to explore ‘alogism,’ creating works that sometimes included text and strange juxtapositions and that resulted in pictures that were essentially hard to read or to resolve. 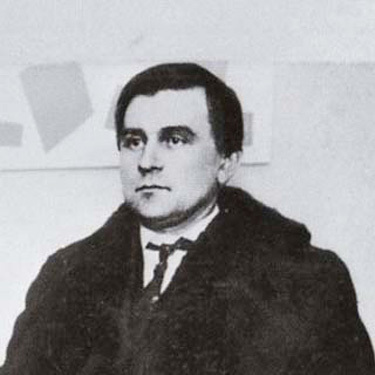 It was ‘alogism’ that underpinned Alexei Kruchonyk and Mikhail Matyushin’s opera Victory over the Sun for which Malevich designed the sets and costumes in 1913. Some of the design elements in this opera prefigured the complete break with figuration that would be marked in Malevich’s Black Square and the subsequent Suprematist works. ‘Objects have vanished like smoke,’ Malevich explained, looking at the disintegration of form that had progressed through Cubo-Futurism and Alogism. ‘To attain the new artistic culture, art advances toward creation as an end to itself’ (Malevich, quoted in A. Nakov, Malevich: Painting the Absolute, trans. M. Taylor & H. Knox, Farham, 2010, Vol. I, p. 288). It was in 1915, the year that he painted Black Square, that Malevich also wrote on the concept of Suprematism. Alongside this work came others such as Black Circle and Black Cross, many of which were exhibited together in a highly unorthodox display occupying various spaces on the walls of the 0.10 exhibition in Petrograd; Black Square itself was hung in the corner. When the Russian Revolution came, Malevich’s futuristic and non-representational art form found a new and receptive audience. He was granted teaching positions, not least in the art school that Marc Chagall founded in Vitebsk, where he also worked alongside El Lissitsky. While there, Malevich even managed to engineer a minor coup, removing Chagall and thus turning from subjective figuration towards abstraction. However, in later years, the tide turned again; by the end of his career, Malevich’s works were considered degenerate by the Soviet authorities, and many of them were stored in obscurity in the State Tretyakov Gallery. Malevich was eventually forced to paint in a more conservative, emphatically figurative style that saw him return to themes of peasant life, albeit with occasional playful flashes of Suprematism appearing here and there in the compositions. His influence was in part secured internationally through works that were left either in Amsterdam or in Germany after exhibitions; in the case of those in Berlin, a number were presciently smuggled out by the legendary museum director Alfred H. Barr, Jr – two of them rolled into his umbrella. Among them are some of the best-known works in the collection of the Museum of Modern Art, New York.